Road-works can seriously disrupt cycling. If cyclists are forced to dismount, to make longer journeys or to ride on roads full of motor vehicles then these inconveniences and dangers could cause people to stop cycling. Cycling is fragile. It doesn't take many bad experiences to make people give up. If people break the habit of cycling they may not return very quickly. That is why it is important that the integrity of the fine grid of high quality cycling infrastructure required to achieve a high cycling modal share is maintained during road-works. 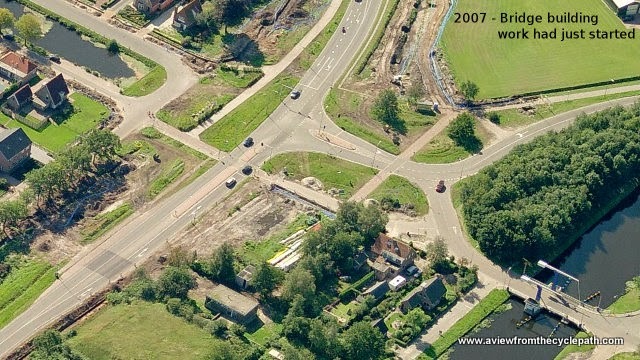 A large junction for cars in Assen is being reconstructed. It's on a busy cycle-route so this has been maintained by building an easy to use temporary route through the construction site. While works take place on the ring-road of Assen, motorists are required to drive in one direction only on part of the ring road. Driving straight through attracts a €140 fine. This does not affect cyclists because we have a separate cycle-path. Works in the countryside have meant closure of a short length of cycle-path. A lane from the road is taken in order to preserve good cycling conditions. This cycle-path is used almost entirely for recreational use, but it is still important that cycling should not be disrupted even here. On this blog there are many other examples of how road works can be made not to prevent cycling. See all the "Road works vs. the Dutch Cyclist" blog posts for more videos and photos showing how road works in any situation are made to have as little effect on cyclists as possible. 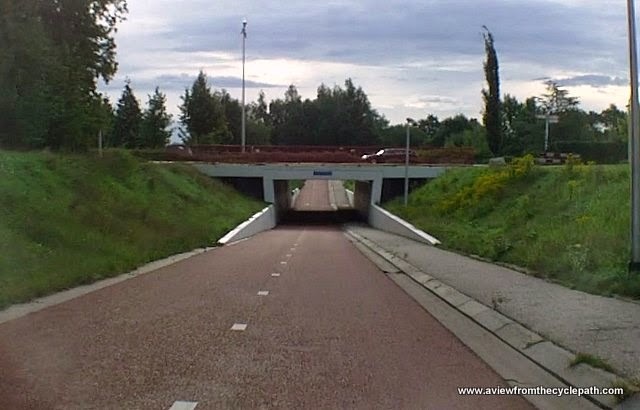 Assen's best bicycle "tunnel" is a bridge. How a crossing of a main road, once a large traffic light juncion, has been made almost invisible to cyclists. The video has a short spoken introduction but I then shut up and let you hear for yourself how quiet and peaceful this area is for a place where we cross four lanes of motorized traffic. This is not peak bicycle traffic but an average level of traffic for mid morning. 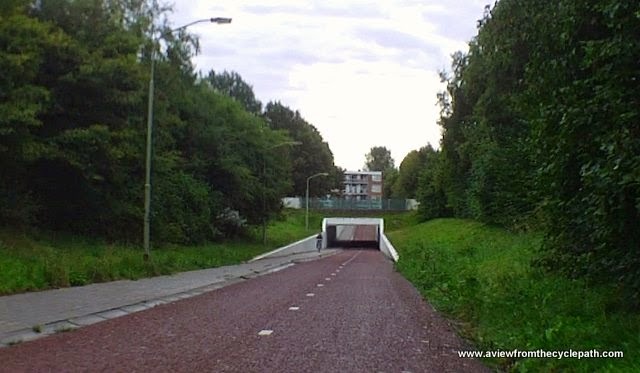 The video above shows the best "bicycle tunnel" in Assen. It's actually a bridge for cars. This deserves some explanation. In the 1960s the canal which used to head to the centre of Assen in this location was filled in and a ring-road built around the city. Until late as early 2007, the ring-road was still at ground level. At this point Assen could be accessed by motor vehicles heading in from villages around the city. The lifting bridge was used by motor vehicles and cycle alike. When cyclists wanted to go to the centre of the city they had to use a light controlled crossing and wait for a gap in the motor traffic. Boats could of course not access the centre at all. as a result of this bridge being built, but cyclists did gain. However, Assen has been growing rapidly and a new suburb on the west of Assen needed not only better facilities for access by car, but also required that cycling facilities were improved in order that the cycling modal share of the city would grow rather than shrink as people moved into the new suburb. That is why this area needed to change. The ring-road was to be doubled in width for a short section to allow for the large increase in population at this side of the city. It's unrealistic for cyclists to expect that roads should never be improved as unless we're going to ban people from owning cars, people will want to drive the cars that they own. The Netherlands is remarkably free of obviously anti-car policy. The highest cycling modal share in the world is the result more of cycling being made attractive than of driving being made unattractive. When infrastructure is retrofitted to an existing city, as happened here, we do sometimes have to be pragmatic - hence the bicycle road discussed below rather than a cycle-path as the direct route to the city centre from this point. However we should never accept that cycling infrastructure comes second and should be built to a low standard. Cyclists should benefit even from new road building. The existing road to the centre was no longer to be used for motor vehicles. Rather, this most direct of routes was changed into a bicycle road divided by stretches of cycle-path so that it could not form a through route by car. The existing lifting bridge became part of the bicycle road, also used only by residents' cars for access. This has now become a main bicycle route unravelled from motoring routes. As a side benefit, the canal could also now be re-opened as a public amenity (these days it's used for tourism, not for industry). to avoid the funneling problem. Note that this is just one of many crossings of large roads and railway tracks in Assen, just one of many crossings which prioritize cycling. A bridge for cyclists to cross the ring-road was considered, but this would have had to be extremely long to have the required gradual incline and of course any bridge requires cyclists to climb to a considerable height before they can ride back down the other side, which slows cyclists down. Cycle-paths should be built to maximise the speed of cycling in order to make this mode as attractive as possible. Therefore it is best to avoid high bridges. The option of a tunnel was also considered. This would also have solved the problem of expecting cyclists to wait and it would have come without the price of sending bikes and their riders up an incline. However it would also have required sending people into a hole in the ground and it was judged that in this case the subsequent reduction in social safety could lead to less cycling. The distance between the new suburb and the centre of the city was already long enough. It was considered to be important to keep journeys times so short as possible and to avoid any other reasons why people might choose not to cycle. So the city chose to leave cyclists on the level and to build a bridge which carries four lanes of motor vehicles above the cycle-path. It is easier for motor vehicles to climb than for cyclists to climb. Cyclists stay on the level, but with no need ever to stop for the road. Sound barriers were installed which make the sound of motor vehicles almost completely disappear. Cyclists now barely even notice when they cross the ring road. If your aim is to encourage cycling then it's important for the cycle route to be as good as it can possibly be. This means it should be so direct as possible and have so few stops as possible. In the 1970s this was a narrow through road shared by cyclists pedestrians and motorists. Because roads like this encourage high speeds, a hand painted sign reading "drive slowly" was put up by a resident. The same road is now a bicycle road. It is no longer possible for motorists to use this as a through route. Therefore motorists use this stretch of road for access to just 11 houses which still exist along here. For cyclists it's a busy through route which provides part of a straight line cycle-route between the new suburb of Kloosterveen (planned for 9000 homes) and the city centre. Local residents no longer have a need to erect signs to ask drivers to slow down for the sake of their safety. True mass cycling is enabled when the entire population is attracted to cycling and when all journeys can be made by bike. Cycling is made attractive by segregating cyclists from motor vehicles almost 100% of the time because motor vehicles are what people fear most when cycling. In the Netherlands this has been done by building a remarkably tight grid of cycling infrastructure which would be considered to be exceptionally good in any other country. No-one has to make their journey in unpleasant conditions which might scare them off cycling. The need for a high quality grid of traffic free routes was the most important lesson learnt by the Dutch way back in the 1970s and this is what has been built upon since that time. Nothing stands still. All cities across the Netherlands continue to improve their infrastructure. During the seven years that we have lived in Assen, the majority of the city's cycling infrastructure has been improved. Other places can't catch up by doing less, only by doing more. We visit this bridge and ride the entire length of the bicycle road on our study tours. The whole of the uninterrupted route between the bridge and the city centre can be seen in a video. Link to Bing Maps bird's eye view of the site of the blue bridge. Floor has a hearing problem but that doesn't mean she can't cycle. A limited hearing sign warns people behind her not to rely upon being heard. A hearing problem or even a complete lack of hearing can cut people off from what is happening behind them. This is a potential problem when cycling because cyclists rely upon ringing a bell or their voice in order to communicate that they wish to pass. In the Netherlands, everyone cycles. 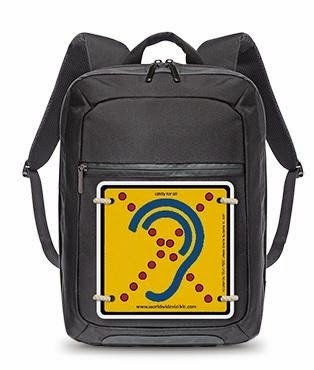 That includes people with many disabilities including limited hearing and deafness. The Stichting Plotsdoven (Sudden Deafness Foundation) are amongst the people promoting the sign shown on the back of Floor's bike above as a way to warn cyclists that the rider ahead of them cannot hear their bell. There has actually long been another symbol used on bicycles in the Netherlands to indicate the same thing. 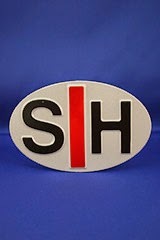 An SH sign is seen quite often attached to the back of bicycles. 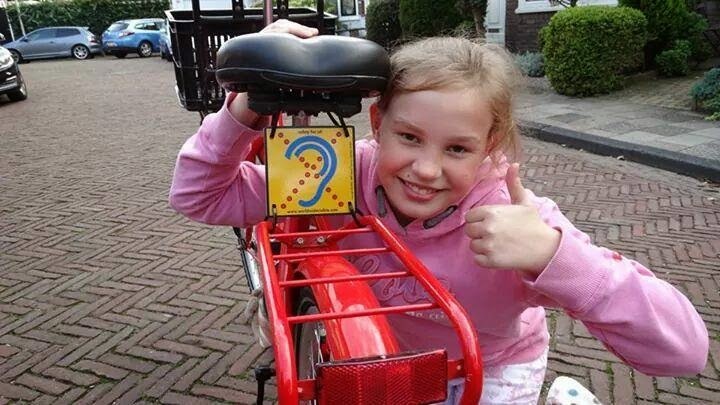 Because the new yellow sign does not rely upon knowledge of Dutch and because the picture of an ear gives a greater chance that people will understand what the sign means without being told, this is perhaps a better idea as a standard for international use by cyclists with limited hearing or deafness. For now, though, cyclists in the Netherlands need to know what both these signs mean. A couple of weeks ago a campaigner from Cambridge in the UK asked me a question about bridge parapet heights in the Netherlands especially with regard to clearing railway lines. He'd realised that he'd not had any problems due to climbing bridges in this country and assumed that the Dutch had standards which were more suitable for cyclists than the UK. Crossings marked with an X are cycle and pedestrian exclusive crossings. Note that all but three of the combined crossings for cyclists and motor vehicles in Assen have separate cycling infrastructure. 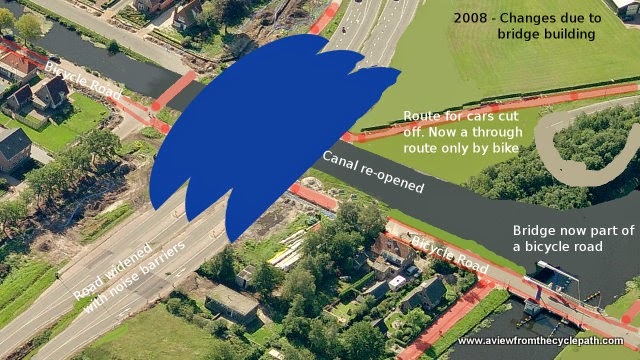 Crossings of the river Cam and canals in Assen are not included though they make much the same point. There are many canal bridges in Assen - mainly cycling specific flat opening bridges which do not require riding uphill and none have obstacles upon them. Assen's many crossings form important links in the fine grid of high quality cycling facilities required for a high cycling modal share. like this example in Cambridge. As you can see, in both cities, the railway line cuts the eastern part of the city from the western part while major roads have a similar effect on the western parts of the cities. The maps show crossings of motorways and ring-roads only, excluding rivers and canals as well as roads closer to the centre. The railway has a similar effect on both cities, cutting off people in the east from the centre. More people live east of the railway in Cambridge than is the case in Assen. Note that in Assen all the most commonly used crossings are either tunnels or level crossings while in Cambridge the majority of crossings are bridges. It's a similar story with major roads. Both cities have a motorway running north-south west of the city. Cambridge also has a dual carriageway (a road built to motorway standard) running west-east across the north of the city, while Assen has a partial ring-road which runs around the west of the city. 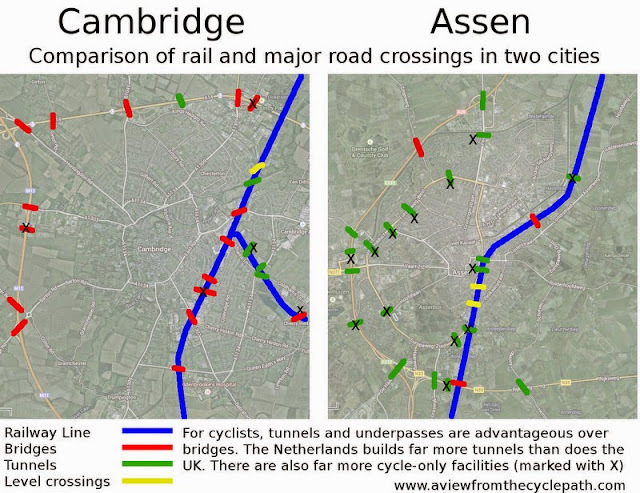 These roads are crossed almost entirely by tunnel or level in Assen while they are crossed by bridges in Cambridge. crossings of a major road in Assen. 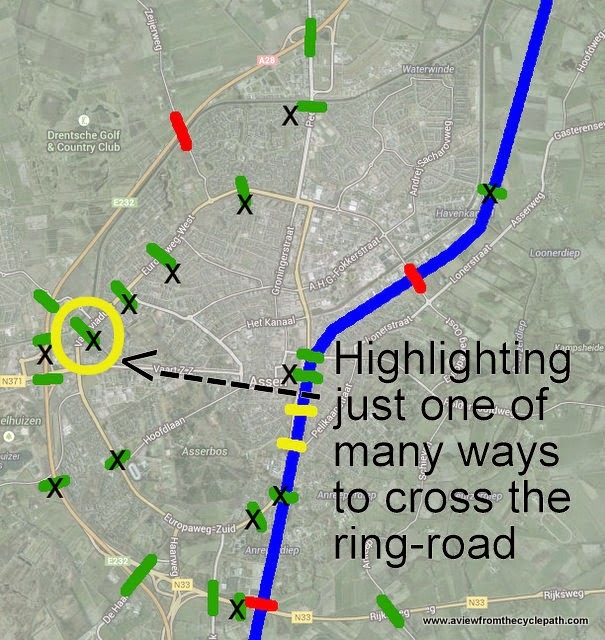 Note also that in Assen the crossings mostly have an X which indicates that they are cycle-specific crossings. There are also crossings shared with cars, but these include separate infrastructure for cycling. In Assen it is rare for a cyclist to use a bridge, common to use tunnels, and very often we cross on infrastructure which is cyclist specific so that cars are rarely seen. 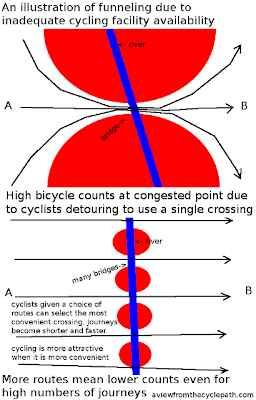 In Cambridge the crossings are mostly bridges, usually along the same routes as used by cars, and in several cases you have to cycle on the road to cross major roads or the railway line. underpass being redesigned at 3.5%. 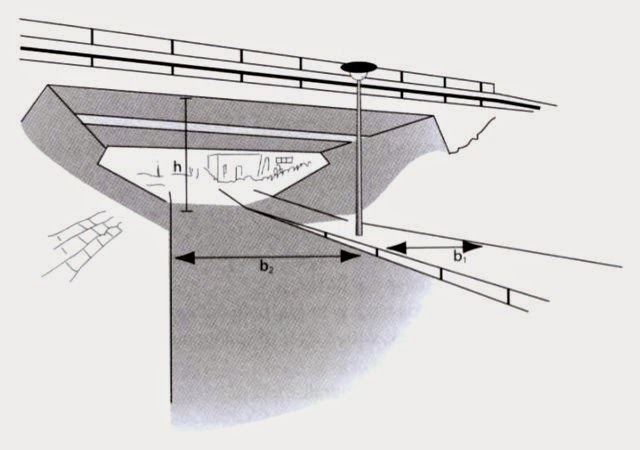 The CROW Design Manual for Bicycle Traffic includes many details of how both bridges and tunnels should be designed to make cycling over and through them safe and convenient. I'm not going to repeat all of their recommendations here but will include some important points. Upward inclines: "Upward inclines require cyclists to make an extra effort and should be avoided where possible in the design of a bicycle friendly infrastructure." Downward inclines: "On long declines, attention should focus on the speed of the descending cyclist". It is suggested that planners should expect "35 to 40 km/h" and that there should be "plenty of free deceleration space at the bottom of inclines, with no intersections, sharp bends or other obstacles in the way". Absolute minimum width of cycle-paths should be 3 m. That's permissible only if there's a separate 1 m minimum walking path on both sides of the cycle-path. Without a separate walking path (i.e. where no pedestrians are expected, this isn't shared use) the minimum width becomes 4.15 m, made up of 3.5 m cycle-path plus 0.325 m clearance between each side of the cycle-path and any railings or wall. All the examples in Assen meet all these requirements except for one tunnel built in the 1960s which is a little too narrow. Generally speaking, it is better that cyclists do not have to climb to cross roads or railway tracks. 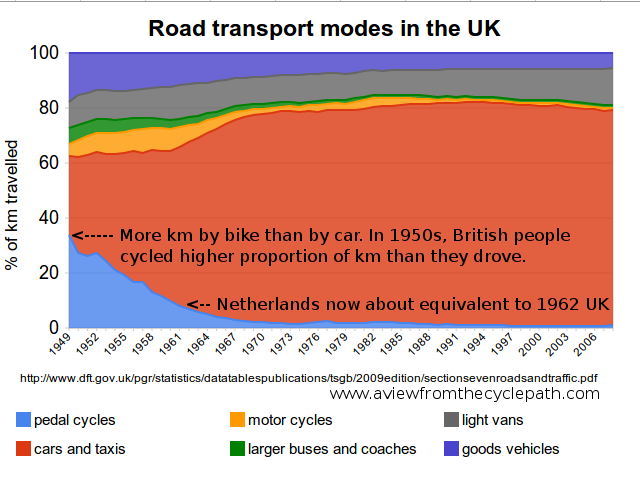 It is better to have cyclists continue on flat infrastructure and that powered vehicles should climb. are completely flat like this example. Gradients should not be constant all the way up the incline. Cycling speed diminishes when climbing. For relatively short inclines (height less than 10 m), the highest section should be less steep than the lowest section to enable cyclists to maintain an almost steady speed uphill. If a height over 5 m must be climbed, 'resting places' in the form of a horizontal section about 25 m in length should be provided before cyclists must to climb again. Wind nuisance is greatly increased on an exposed bridge so this should be taken into account. Climbs against the prevailing wind should compensate by being less steep. Wind barriers can be installed on bridges to reduce the nuisance to cyclists. It should be possible to cycle onto and over a bridge. Cyclists should never be required to dismount. Escalators or lifts to access the bridge are OK as a last resort measure. Suggestion that with a cycle-bridge across the road: if necessary the road should be lowered to make the cycle-bridge less high. Steeper gradients can be used than with a bridge because cyclists going into a tunnel first ride downhill and pick up speed which can be used to climb back out of the tunnel. Tunnels can be made less deep by moving roads and railways above them upwards. Social safety issues should be addressed by making it possible to see out of a tunnel before you enter, and by avoiding long tunnels. A "semi-buried" design can work well, with the road above rising by about two metres, effectively a small bridge. This makes the tunnel into an open structure and reduces the change in height required of cyclists. Tunnels require good drainage (often pumped) and should be designed to be easy to clean. Tunnel height should never be less than 2.5 m and width should be no less than 1.5 x the height in order that the tunnel feels comfortable to use. Lights and light colours are preferable in a tunnel to make it appear as 'open' as possible. The time spent in a tunnel should be minimised and sides should be splayed outwards. Some of the suggestions refer to social safety issues. In short, infrastructure should not lead to a feeling of unease, especially after dark. slightly as the cycle-path drops. Tunnels have a smaller height difference than bridges. Only need clearance for the height of a cyclist, not for trucks or trains plus electric lines. Tunnels are easier to fit into an existing landscape. There are also other advantages which may seem to be quite small such as that tunnels naturally provide shelter when it rains. A possible disadvantage is low social safety. It is important that cyclists can see out of a tunnel before they enter it. There should be no turns within the tunnel, no-where for a potential mugger to hide. Obviously tunnels should also be well lit. Drainage is very important in tunnels. The Netherlands has many tunnels which are below the water table and require pumps. Nevertheless, it is rare that tunnels become flooded. replaced a large flat road junction. If possible, it's best that cyclists don't have to change level at all. If motor vehicles can be sent into a tunnel or over a bridge then they no longer hinder cyclists. In 2007, there was a traffic light junction at this location in Assen. For cyclists to use the road to travel directly into the city they had to stop at a traffic light. By 2008 this bridge had been built. It severs the pre-existing link by motor vehicle into the city, leaving the direct route as a bicycle road which excludes through motor traffic. This bridge has no utility for drivers. It actually reduces their options as it is now impossible for a car travelling over the bridge to turn left of right as used to be possible. Instead of building this bridge to carry four lanes of motor vehicles, a much smaller and less expensive bridge could have been built to take cyclists over the road, a small tunnel could have been excavated to take them under the road or a signal controlled crossing could have been installed on the level. However all these other options would have meant a reduction in speed and convenience for cyclists due to inclines for bridge or tunnel and delays at traffic lights for a level crossing. There could also have been social safety issues. The solution, to ensure the best possible service for cyclists was this bridge. Cyclists now have a smooth, level uninterrupted route which is well lit at night and has good sight lines in all directions. Just as recommended by CROW, motor vehicles have to use inclines in this example rather than cyclists. to see lots of bikes but good for individual cyclists. Unless enough pleasant routes are provided, excess numbers of cyclists are likely to be seen on the few remaining routes. It can be especially a problem where there are too few crossings of railway lines, major roads or rivers. Such funneling can make for great promotional headlines ("N bicycles per day pass this point") but actually it's not good news for cyclists at all because this actually means a detour onto overcrowded cycle-paths and conflict. It is far better for cyclists that there should be more available routes so that more people can make direct journeys and there is less of a need to detour to find a comfortable route. Detours should be minimised by providing extra cycle crossings of large roads, railway lines, rivers and canals. This makes cycling more viable for more people and therefore more attractive. This principle should not only be applied for what are considered to be practical routes - CROW state that "recreational routes can also form reason enough to remove barriers". 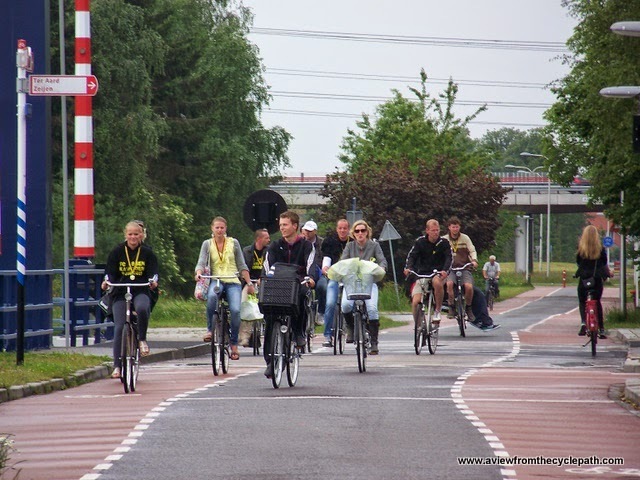 Groningen has many students, making up a relatively transient population who while they are more likely to cycle are also likely not to know the local area well. The city used specific marketing to encourage people to choose a selection of other routes which would serve them better. However, it's important to note that this was only possible because a very comprehensive grid of cycling infrastructure already existed. I've often railed against hype about exceptional pieces of infrastructure. They're nice to see, but not really very important. The fact is that a few impressive bridges or tunnels are of relatively little use unless they form part of a comprehensive grid of good quality infrastructure. The grid is really the exceptional achievement of the Netherlands. The grid is the thing which should inspire and be copied elsewhere. Tunnels are less photogenic than bridges, but they are preferable for the reasons explained above. However, whether tunnels or bridges are built it is most important that there are enough of them, that they are of high enough quality and that they link everything else together. Both tunnels and bridges feature on our study tours. The Cambridge map does not include the Newmarket road roundabout underpasses as they do not cross railway or motorway. Nearly at the geographic centre of the map above, these underpasses are right not well loved. They are bad examples for a number of reasons include low social safety and sharp turns at the bottom of inclines. It also does not include the Northfield avenue underpass for similar reasons. This is flawed mainly due to dangerous railings within it. There are also many bridges in Assen which are not included on the map because they don't cross main roads or the railway, but all those which have a significant incline in Assen are on the map. The point of the maps is not to show all bridges and tunnels but to show red vs. green. i.e. emphasis on bridges in the UK vs. emphasis on tunnels in the Netherlands. must drive the same way back again to leave. It may not look like it, but the photo above is actually an example of very good infrastructure being used as intended. The club building was built on a strip of land between the large and wide ring-road (in effect an urban motorway) and part of the existing cycle-path network. There is no way to access this sports club except via the cycle-path. No other route exists and there is nowhere to build another route. 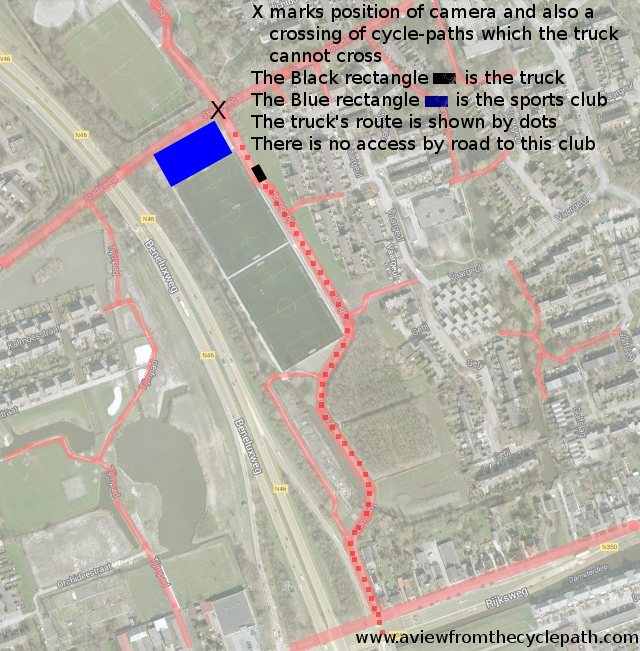 Therefore there is no choice but for deliveries to the sport club to use the cycle-path. Football players and audience members also cycle. There's a car park nearby which can be used but it's a fair walk between there and the club. The junction between two cycle-paths from where I took the photo. The speed bumps are designed to have no effect at normal cycling speeds. They are an effective measure to slow mopeds, permitted on this cycle-path, at the junction. Trucks using the cycle-path leave in the same direction as they entered. They don't continue and use the cycle-path as a through route because there's a busy cycle-path junction in the way. The cycle-path isn't abused as a through route by drivers. As part of redevelopment of this area, cycle-paths were widened and gained a smoother and more robust surface. This is a big plus for cyclists. The small cost is that a truck has to come along here perhaps once or twice a week to make deliveries. The alternative in this situation would have been to convert the cycle-path into a road or to not have built the sport club at all. In this case, pragmatism means an obvious and large win for cyclists. It also serves footballers who cycle to the pitch and like to drink beer afterwards. Two homes in this location in Assen have garages next to each other which open onto the cycle-path. The cycle-path is therefore used very occasionally by car by those two families. A very minor inconvenience for cyclists in comparison with the major gain of being able to use this cycle-path and its associated tunnel to avoid a large and very nasty traffic light junction. Cyclists never have to stop at those traffic lights because this facility exists. A major gain for cyclists due to a little pragmatism. The house was built long before the cycle-path. The residents of the house need access by car to their garage. It's no problem at all that they are given this access. Cyclists gain a marvellous wide and efficient cycle-path. Most cyclists won't realise that part of this "cycle-path" is actually a road. Part of a bicycle road in Assen. This very popular very high quality route for cycling provides the shortest possible way into the centre of the city for people who live in a new suburb. It was only possible to provide this by being pragmatic. There is no through traffic here so the only motor vehicles along this short stretch of road are for access to ten homes situated along here. Most of the time, this works as a de-facto cycle-path which is 5.5 m wide. A huge improvement over this being a route into the city by car, as it was until 2007. Cycling is safest, most pleasant and most efficient when cyclists do not have to "share" with motor vehicles. The greater the extent to which motor vehicle and cycling routes can be unravelled, the greater proportion of the road network can be dominated by cyclists. It's not possible to achieve this while roads remain as useful through routes by motor vehicle. There are many ways in which cyclists can be segregated from motor vehicles without building cycle-paths. Nearly car free streets in the centres of Dutch cities provide excellent cycling conditions while also allowing access by car. Pedestrianized zones in the Netherlands usually allow access by bike. These situations are almost opposites of one another, in that motor vehicles mustn't create problems for cyclists in the first while cyclists must not create problems for pedestrians in the second. We have examples of both which work extremely well. It's a rare person who complains that maintenance vehicles will occasionally drive along cycle-paths, but of course they must do so. Good maintenance of cycle-paths as well as such things as cutting grass or dredging canals next to cycle-paths will always require access by some maintenance vehicles. This cycle-path in Assen belongs to the local water board. It's an essential part of our flood defences but also forms a very useful cycle route. The slight downside is that we very occasionally have to share it with a maintenance vehicle. In the countryside there are many cycle-paths used mainly for recreational use which were once farmers' tracks or which go through natural areas by following a similar line to vehicles used for maintenance within those areas. This photo is from last Sunday's recreational rides through the countryside near Assen. A beautifully smooth cycle-path which was once a farm track. It's still, necessarily, used by the farmer so occasionally we meet tractors along here. The farmer has gained a much smoother tractor path than he had before while everyone else gains a wonderful facility for cycling in the countryside. Cyclists should never have their journey made less convenient, less direct or less safe due to motor vehicles. Cyclists should never be given a choice of either a "safe" or a "fast" route to take, all routes must be both safe and fast. All routes should work for all cyclists. We don't plan roads for timid new drivers differently to how we plan for experienced drivers, and the same should be true for cycling. Cyclists should not be forced to fight for space with motor vehicles as this is not a fight fought on an equal basis and it cannot be won in favour of the majority of people cycling, regardless of training or experience. In practice, places which don't provide good infrastructure for cycling simply have fewer cyclists. Compromises on quality lead to fewer people cycling, so quality should never be compromised. Progress is not made by adopting low aspirations reflected in inadequate design guidelines as these in themselves come to stand between potential cyclists and cycling. Cycling expands in popularity only by winning a popularity contest, by being the most attractive contestant. To encourage people to cycle, cycling needs to become the most pleasant and convenient way to make a journey. There will always be places where cyclists must come first but where access by motor vehicle is sometimes also required. We shouldn't be afraid of this, but instead make sure that it is something which is planned correctly so that 'sometimes' really does mean 'sometimes'. Occasional use by a resident's car or by a tractor or maintenance vehicle, as shown above, is not a problem for cyclists using cycle-paths any more than it is if a cycle-path is occasionally used by an equestrian or pedestrian. This is where real pragmatism comes in. Near 100% segregation of cyclists from motor vehicles can be achieved so long as we accept that there will be very small compromises. There should never be wholesale compromises on quality. Nothing should be compromised easily which will diminish the overall experience of cycling. to be found on Dutch cycle-path. While they are sometimes thought of as synonyms, pragmatism and compromise have quite different definitions. Pragmatism demands that dogma be put aside so that we can make a rational choice and take a practical point of view. As an example, while we don't normally want trucks to be driven along cycle-paths, I've yet to hear anyone argue against snow-ploughs driving along cycle-paths in winter. The examples above fall into similar categories. Campaigners should always be pragmatic but compromises should be rare. Problems for cyclists arise when other modes come to dominate what should be cycling infrastructure or if accommodating these other modes changes the design of what should be cycling infrastructure so that it in fact becomes more suited for another mode. This principle applies even if it affects only part of the day. There's no point in suggesting that usually "empty" roads which fill with motor vehicles at rush hour or at school times are suitable for cycling because at those times of the day, which will also be busy times for cycling, they won't be suitable. Designs encouraging cyclists and pedestrians to share cause conflict because these two modes are not compatible. Similarly, shared spaces for cars and bikes have proven to be dangerous. These also are not truly a cycling measure but readily demonstrate exactly the problems caused by allowing other modes to dominate. Sometimes suggestions of compromise comes not due to another mode, but because of specious reasons such as false environmentalism. This also needs to be resisted. Any problem that can be caused by a cycle-path and cyclists using it is minute next to the problem which would be caused by building a road and people making their journeys by car instead of by bike. This comes up remarkably frequently. Of course, not planning to accommodate cyclists safely at all is the biggest compromise and it remains the biggest danger. This is what led to huge declines in cycling in many nations. Dutch cycling also went into free-fall, but the decline was turned around in the 1970s due to concerns about rights and safety of children. Any of the situations described in the last few paragraphs are a compromise too far because such compromises damage cycling. Where motor vehicles dominate it's important that there should not be "sharing". In those locations it's essential to provide proper cycle-paths and well designed junctions to prevent clashes between cyclists and motor vehicles and it's essential that these are conflict free. This is the only way to make cycling pleasant and convenient for the entire population. Legacy ? What legacy ? Sporting events _don't_ change peoples' behaviour. But proper cycling infrastructure certainly leads to more cycling. It's become popular for there to be claims that sporting events will be followed by a "legacy" of changed behaviour. Somehow, the public are expected to behave differently after seeing other people exercise. London's Olympics were supposed to have inspired a generation to take up sport and to improve the population's health. Similarly, the Tour de France starting in Britain this year is supposed to lead to an upsurge in cycling (despite the fact that 101 tours have not yet had that effect in France). Assen. 31 July 2014. One of many motor racing events in the city. If any place ought to be able to demonstrate the power of a sporting legacy, it's Assen. This small city has hosted the annual motorcycle TT since 1925. A special circuit for the TT, known as "The Cathedral of motorcycling", was built just outside the city in 1955. The TT is a huge event. For a few days each year the city's population is tripled by the enormous crowds of motor-sport enthusiasts who visit to watch the racing. Every local farm becomes a camp-site, the city puts on a huge party with live music in the centre until the early hours. It's a great event ! Assen. 1st August 2014. People cycle past the "donuts" left on the road by a Formula One racing car last night. Is this a motor racing legacy ? This is one of many excellent simultaneous green junctions in the city. What's more, there are many other motor-sport events every year. 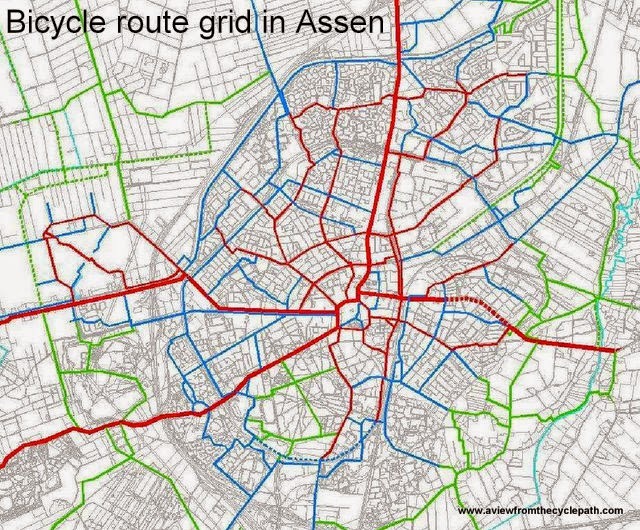 But despite all this, the people of Assen make more of their local journeys by bicycle than they do by car. Why ? Cycling has been made extremely safe and it's more convenient than driving. People don't all drive around the city in Formula One cars or ride on racing motorbikes, they react to what works best for them. That is why cycling is the single most popular mode of transport in this city. Assen 1st August 2014. The European Junior Cycling Tour is taking place in and around the city this week. This road is closed to normal traffic today so that the racers use it. This is fabulous, but it isn't what makes Assen attractive for everyday cycling isn't a few roads closed for a few days per year, it's the comprehensive network of cycle-paths like that on the right of the picture, which go everywhere and are open 365 days a year. Assen also hosts a great number of cycle sport events. Cycle-sport is extremely popular in Assen - enough that the city has many facilities for different types of cycle-sport. In 2009 the first two stages of the Vuelta a Espana were in and around Assen. At the moment the largest youth cycle racing event in Europe is taking place right here in Assen, this being their 50th year in the city. But cycle-sport in the city no more influences the means by which people make everyday trips by bike than does motor-sport. Sports are great, but everyday cycling has nothing to do with sport. Not even with cycle-sport. The child on the right may decide that he likes what he sees. Perhaps he'll join a local club and start racing with those on the road. But he might also prefer football, or be more interested in reading than in any sport. Nevertheless, he's riding a bike now and will do so tomorrow as well because that's a sensible way to get around the city. Note that the car is supporting the cyclists. The road is blocked to through traffic. Everyday mass cycling is not enabled by temporary road closures, it requires a permanent grid of excellent quality cycling infrastructure. If this is built to a high enough standard then cycling ceases being the preserve of a brave minority and instead, everyone can cycle. Good cycling infrastructure caters for cyclists of all abilities and all speeds. Infrastructure which is good enough to enable truly safe and convenient usage by children riding en-masse to make school trips is also safest and most convenient for those who like to ride fast. The Dutch don't cycle because it's "in their culture", people in other countries used to cycle just as readily as the Dutch do now. These days, the Dutch cycle more than anywhere else because the infrastructure makes cycling an easier choice here than anywhere else. There's no mystery. We know what is required to enable mass cycling: Build a grid, make cycling safe, convenient and pleasant for everyone, and people will ride bikes. This applies even in a town famous for motor racing. By all means host events such as large cycling races. They're a great thing to see. But they should not consume funds intended for cycling infrastructure because once the race has gone through everything will go back to normal. More smoke and noise here, and preparations for it in our local TV coverage. The TT festival can be very amusing. A few years ago it brought a jet powered motorbike to the city centre. Oddly enough, that also brought no "legacy". I've not seen even one person riding a jet powered motorbike around the city since then.